If you're making your own bookshelves -- which is a good DIY project for an intermediate-level woodworker -- the dimensions you need to consider are the height, width, depth and spacing between shelves. Shelf spacing varies depending on the size of the books you plan to keep in the bookshelf. A bookshelf with spacing of at least 12 inches between shelves. 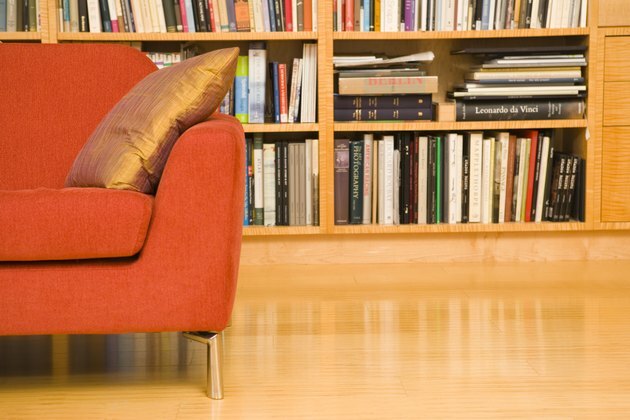 A good average spacing for shelves is between 8 and 12 inches. If you have oversize books to store, you might prefer to increase the spacing to 15 inches. If you're storing a combination of large and small books and need to vary the spacing between shelves, keep the wide spacing on the bottom; this prevents the bookshelf from becoming top heavy and tipping over. If you're building your own bookshelf, you may choose to make the shelf spacing adjustable. Drill a series of holes on both sides of the case that can accommodate metal or plastic shelf supports. When you want to change the spacing between a pair of shelves, remove one of the shelves, move the supports up or down as needed and replace the shelf.